Check Out Our Esri UC Presentation & Visit Us at LGA! This week has a been a whirlwind for the teams here at New Century! 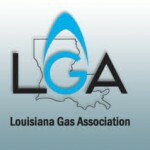 Our DOT Compliance team is down at the Louisiana Gas Association's Pipeline Safety Conference in NOLA representing the company and taking in all they can about pipeline safety. As Gold Sponsors of the event, we've been thrilled with the sessions, networking opportunities, and attendance. It's been a great week and it's still going - be sure to stop by booth 12 if you're down there!